My blog site has been quiet for a long time now. That means that all is not well in the State of France! Nor in the State of South Africa and Not in the United States. Nor in the state of Ed! We are all familiar with the terrorist attacks in France and Je Suis Charlie and all the subsequent terrorist attacks. In South Africa, we are currently dealing with student boycotts, fees must fall, university closures and police brutality and racism. In the USA, it’s all about Hilary and Donald – another Clinton and who holds the Trump? I tore a tendon in my ring finger some four months ago. Two months of care has followed, an operation and a further two months of rehabilitation. Despite celebrating my 60th birthday in September, and having my family and some friends with us, I am battling the physical and mental demons of my illness. Ten years into my illness, I have lost so much. My job, my holiday house, my company, my self-esteem, my bank balance, my driver’s licence and now my car and my independence! The biggest loss, psychologically, has been my car. Being in the car business, Sean sold off my X-Trail. It has gone to St Francis Bay and I hope it accumulates many happy kilometers there. But with it has gone the remnants of my self, and, I must admit, I am struggling with this one. Thank God for Uber taxis! I am struggling with the physical deterioration of my body and the many pills that I have to take daily, just to make me “look so good !”for all of you. My memory is nowhere and my mood swings become greater. I’m shaking like a tree in the Caribbean Hurricane Matthew. Every day is a High Day! My eyesight has become problematic, and my reading ability becomes more and more difficult. To crown it all, that which I do see, I see in double and triple vision. Please God, just one good image and not three poor ones will suffice! We take so much for granted when we are healthy. My sister battles her own health demons and we take strength from the courage, fortitude and determination that she displays each and every day. We pray for her and all others who battle cancer and disease. Holidays are no longer what they used to be and the disintegration of the “nest” has happened to us too now. The High Days are only the high days now! In the words of the student protesters, “The Struggle Continues”! Since returning from Bloemfontein at the end of July, it’s been another hectic few weeks! Firstly, I Discovered on my way to Bloem when I filled up the car that there was no money in my bank account! I then Discovered that my disability benefit had not been paid into my account by my insurers! So, between my broker and me, it took many calls, emails etc. to get that sorted out. Stress and tension don’t do me any good, and not being paid one’s “salary” leads to all kinds of problems at the bank when your debit orders have to be paid! Thank goodness, I Discovered that just in time, and with some fast remedial work, I was able to minimize the damage. I’m still waiting to hear why it happened – it’s not the first time! In between that I met with my bank broker, Kyle Jacobs, at the newly revamped South Ender pub in Walmer; Michael Halbert who helps me with my personal finances, Nelson Mandela Metropolitan University meeting to discuss Phillip’s academic future, Nadine van Westenbrugge to help with admin and the Ratepayers meeting to discuss how best to combat non-service delivery in the Metro. I have been diligently distributing protest letters in the neighbourhood! I had drinks at the Pitch & Putter with Len van Kempen, lunch with Ben Roth and his father at Finezz, brunch with Annette Jones and Liz Findlay at La Boca and Kevin Paul’s farewell party at Finezz before he headed off to the International Swimming Championships in Canada, where he will be swimming this week. At Bluewaters Café, there have been visits from radio listeners, the Coggers and the Serfonteins. I have had my home visits from Gill, the Hospice nurse, and Isaac, my weekly chat buddy! And then there’s a video which Adrian is filming about my life and which will be shown at Mpekweni Sun in September. I am writing the script which also takes a lot of time! Meetings and calls were made to the Groenewalds in Humansdorp to arrange for Martin (injured in Bloemfontein) and his Dad Adriaan to appear on our radio show last week. Julian Fletcher has been at the house on Fridays to massage my tired muscles and I have been to see Stuart Dicke twice on Mondays for some physiotherapy and Johnny Raath for some gym work. My weekly haircuts and beard trims are done by Grant at Front Cover in Newton Park (phone 041 363 2529). Tuesday was the monthly Motor Neurone disease meeting at the Old Grey Club with Stuart Dicke as the guest speaker. Then there have been a few blogs to write, and updating my blog and web sites with pictures and text! On Thursday evening I attended Mandy Gurr’s benefit show, Gino Fabbri’s Just Laughter, at the Old Grey Club, with additional background singing by Mandy herself on a CD that I burned off the internet! And then rugby, rugby, rugby … Phillip’s last school games against Framesby last week and Selborne College this last Friday (Women’s Day). 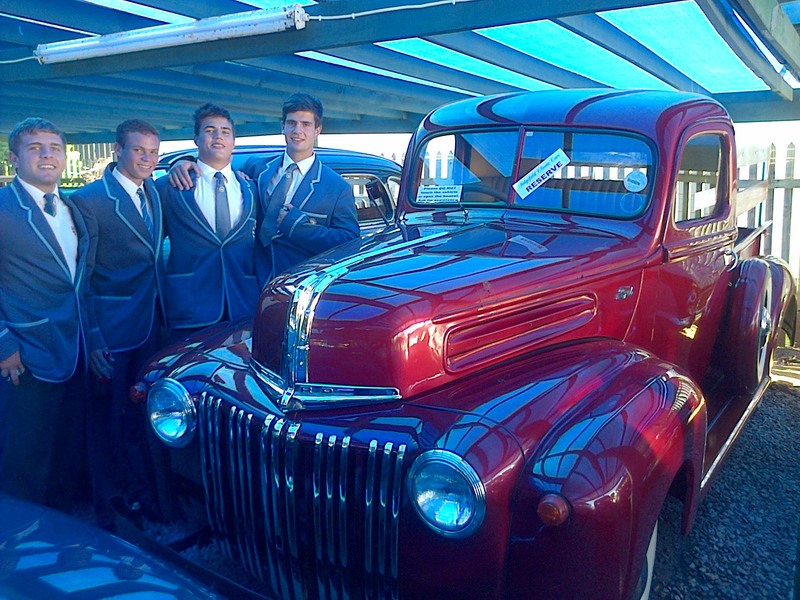 The Boarding House Fundraiser Farmers’ Day was arranged at the same time to maximise profits. Phill’s team lost to Framesby last Saturday but beat Selborne this week. The First Team won both encounters – with Framesby being an exciting last ten minute charge to win the game and Selborne being a white wash victory for Grey! The Firsts are “flying high” at the moment having come to the end of the rugby season with an unbeaten record against Eastern Cape schools. I was flying high on Friday, too; after having had a number of the “Jungle Juices” (orange juice and cane spirits) sold at the Farmers’ Market. I’m not too sure what the interactive effects are of my medication and the cane, but for a while there my body appeared to be working normally! It was really pleasant visiting under the wonderful red Bedouin tent which had been erected in the matric quad to keep us dry from the steady rain which fell on Thursday and Friday. After going home with Sean and Phillip in the late afternoon, I slept right through until Saturday morning! Congratulations must be extended to Niekerk and Ingrid Ferreira, all the boarder parents and the boarders for having arranged such a vibey and, I hope, a profitable Market Day! 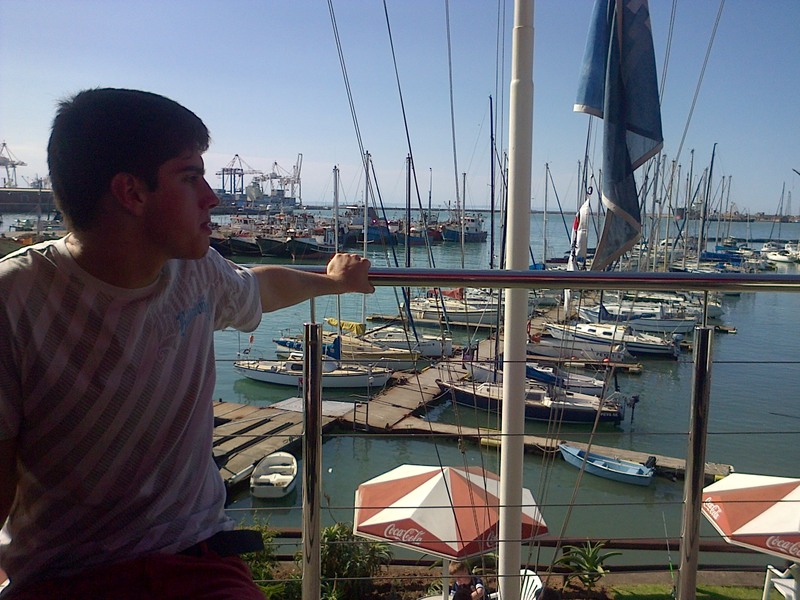 On Sunday, we had a quiet restful family lunch at the Chartroom of the Yacht Club in the Port Elizabeth harbour. Today is a blog write day, a visit from Iain Fyfe, ex-Grey teacher (Sean’s u15A rugby coach) visiting from Hong Kong where he has taught English for the last six years – he left just after I became ill and was happy to see me still in such “good” health, a visit to the physio and the gym and something more mundane like getting the roof repairers in to check on the leaks in the stoep roof! This has been just another “quiet” week in my life – the week that was! I need more Jungle Juice (and Carbolev and Lyrica) to keep me going! I saw that someone commented on my blog site that I was a lousy blogger! I surely am. I have been very busy – various projects and lots of travelling. The internet and my wireless connection are playing up – South Africa must have the worst and slowest internet connection in the world. It’s so frustrating! And when the internet goes down, so does the help desk at MWEB! Fat help that is! And physically, the most difficult thing that prevents me from writing is, believe it or not, my inability to sit comfortably. Pressure on my bum immediately sets my body off into all kinds of muscle contractions and spasms. If only I could find an answer to this one! And my appointment with a specialist that has been recommended, made in January, is only in August! Roll on August and hopefully a solution! So please forgive me as I (slowly) try and keep you updated with my comings and goings … I will try and do that for as long as I can. Tuesday morning, after Sister Gill’s visit at ten, I had Holy Communion with Rev Rowan Rodgers from the Newton Park Methodist Church at eleven. Then a good hour long massage session from Julian Fletcher – the best in town if you can get hold of him! I also booked him for Friday morning – but with Julian that’s no guarantee that he’ll be there! Last Wednesday, after my radio show and weekly coffee at Bluewaters café, I managed to get in a short gym session. I walked for about half an hour on the treadmill and find that walking definitely keeps the leg muscles going. In the afternoon I had my weekly beard trim and my monthly haircut. Grant at Front Cover in Newton Park (041 363 2529) keeps me looking good, so if you need a haircut, give them a chance. Thursday I had lunch with Ben Roff at Spargos. It’s always a pleasure catching up with what’s happening in the real world! In life, just when things are going smoothly and everything is hunky dory, suddenly something happens to upset the apple cart. So a relatively short two and a half hour trip to Somerset East becomes a bit of a challenge. Just before we left Port Elizabeth, I heard on the radio that the Olifantshoek Pass was closed as a result of a truck accident. It would be closed for the next five hours! So, one can’t let life get you down – you need to get the upper hand and make alternative arrangements; make decisions now! Instead, we took the R75 from Port Elizabeth north-westwards towards Jansenville. 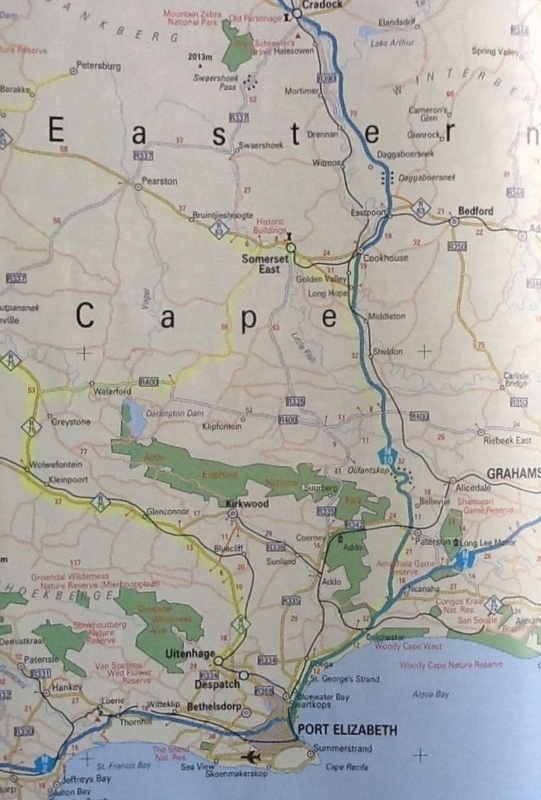 Some 20 km from Wolwefontein we turned eastwards on the gravel road R400 through Waterford, past the Darlington Dam and the northern section of the Addo Elephant Park. Some 30 km from Waterford we turned left and travelled north east on the road to Somerset East. Fifty km from there we entered Grant’s farm Kaalplaas – East Cape Safaris – from the south rather than from the north as we would usually have travelled. In Afrikaans we say “’n Boer maak ‘n plan” (a farmer makes a plan), and we had overcome the challenge of the closed pass. Along the way, we travelled an unfamiliar route to us, through the Noorsveld, and seen another beautiful part of our wonderful Eastern Cape. It’s another example of how one can address challenges in life – we could have stayed at home and said we can’t get there or we could have found an alternative, which we did, and become all the more richer for having done so. We braaied and kuiered (visited) on Friday evening with Grant and Sarine, his parents, their children and the cousins in their beautiful bouma (and two Scandinavian hunters). 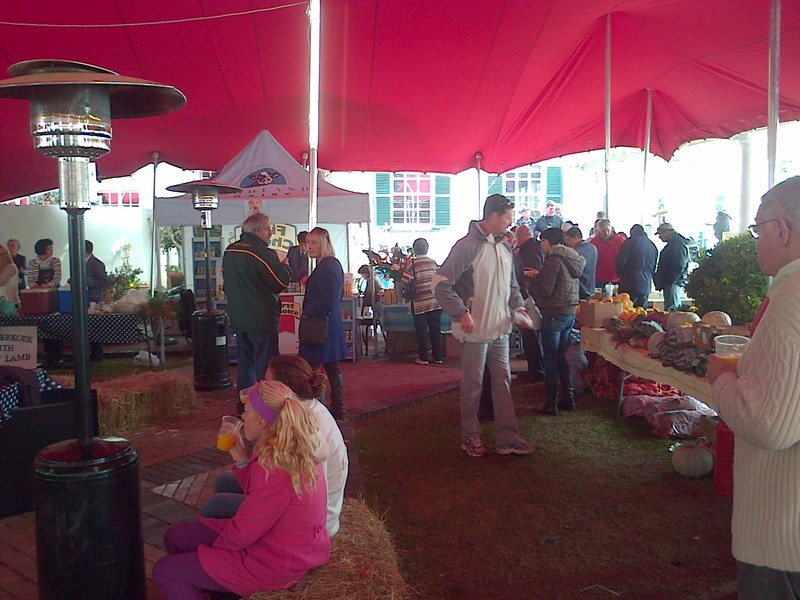 On Saturday morning, after a very large BREAKFAST!, we headed off to the Biltong festival in town. However, we did not stay too long this time – it would appear that the festival is starting to lose its appeal and we were slightly disappointed by the stalls, entertainment and attendance. It will be interesting to see how much longer this festival remains on the festival calendar. It was hot at 25 degrees. We returned to the farm, watched rugby on TV and ate yet again! This time we were joined by Ben, an American hunter who had just arrived from Seattle and Abrie, the professional hunter, who bambooed our outside stoep ceiling last year. On Sunday morning, it was cold at 10 degrees. After breakfast, we headed home, again with Phill at the wheel, but this time headed back to Port Elizabeth from Somerset East and Middleton along the usual national route N10 via Kommadagga, the now open Olifantshoek Pass, Paterson and Nanaga. The weekend had come to an end far too quickly – don’t they all? – and then it was time to prepare for back to school this morning. The three week winter holiday had also come to an end! This morning, it’s back to me and Charlie at home. Even the God’s are crying in the form of the cold and drizzle. I really miss having the company at home! I think Charlie does, too, because he wants all my attention and he is wearing me down. Please excuse the errors in my blogs – my mind is not as clear as it has been, my fingers not so nimble and the errors slip through. I’ll correct them later when I feel better. The voice recognition Dragon software is frustrating me and the internet is slow again! It’s been another busy week, with little time to write. And when I’ve had the time, I haven’t had the energy! So here comes another skeleton, with hopefully the flesh put in at a later stage! Mon 20 May – we celebrated Sean’s 21st birthday at the Coachman Steakhouse; party to follow! About 60 – that’s the meaning of the above title and that’s our ages – give or take a good few years in all our respective cases. 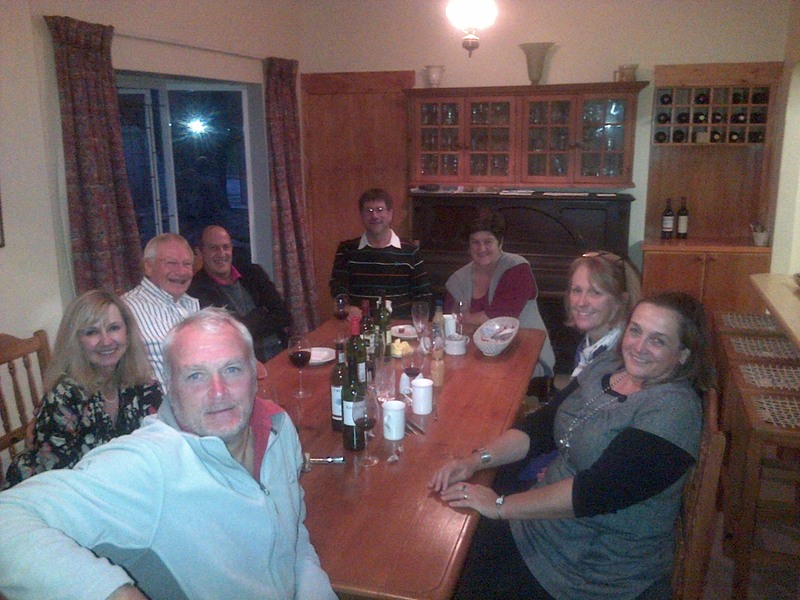 “Our” being Neil and Pam Thomson, Anton and Ingrid Scholtz, Alan and Trish Stapleton and Pera and I. And our connection being that some 20 years ago we started what we called our Investment Club. We met once a month on a rotational basis at each couple’s home for a meal, and each couple “invested” R100 into the Club – Pera and I put in R100 each. My duty was to invest the monthly amount of R500 and to grow the money so that at some point in the future (round about now) we would cash in our investments and go on a “world cruise” together! Two ‘hiccups’ occurred – firstly, each couple produced two more people and the group therefore grew from eight to sixteen people. Our children spoke at school about the Investment Club meetings that they attended on the last Sunday (or whichever it was) of each month! Heaven alone knows what their teachers and friends thought about this! Secondly, at the end of year two, I think it was, when we saw the balance slowly growing in our investment account, we were tempted to draw the money and go away for a weekend together. So, after that, we never ever gave the money a chance to grow enough for our world cruise, but we did, on an annual basis – round about Reconciliation Day public holiday in December – cash in the funds and spend a long weekend together. Well, we never would have had enough for that world cruise, but we invested tremendously in our children’s social upbringing and in their readiness for life. They learned to climb mountains, read hotel menus, order “passion fruit and lemonades”, play golf, ride horses, stage theatre productions, play carpet bowls, manage becoming lost and a host of other things that one could add to the list. We all learned to enjoy friends and family and life and nature and good times together. In the process, we amassed many happy memories and photographs and stories along the way. Unfortunately, as the years passed by, and we all got older, it became more and more difficult to co-ordinate our diaries and do things together. So, some eight (?) years ago, we finally called an end to our Investment Club. But, thanks to the labours of Pera, we managed to have a reunion of the adult members of the Club this past Sunday. Someone suggested that the Investment Club be renamed the Pensioners’ Club! Needless to say, we reminisced (that which we could remember!) and laughed and ate and drank to Life! I haven’t written for a while – not because I’m too ill but because I just haven’t had time! I’m flying high and living life in the fast lane! Today is Sean’s 21st birthday! Another milestone in his and our lives and one which 6 years and eight months ago I never thought I would see. Yes, today we celebrate 21 happy years of Sean’s life. As I said to him this morning, he has brightened all our lives and the world is richer for having him in it. I pray that God may spare us all to share many more happy years together. He teaches me so much about life and how one should handle its challenges and its ups and downs. We are so proud of you, Son, and wish you a challenging, rewarding and trouble-free journey. May the Jeeps and Journeys of life carry you safely through to the other side and may the 4×4’s, the diff locks, the GPS’s and all the other gadgets help you when the going gets tough: Life is never an easy ride – not for anyone and not for sissy’s! Legally, you are now out there on your own, but remember, we are always here to provide you with a safe harbour and love and affection. There will always be food on the table – hopefully, we will see you more often than that! Sean will have a party later when his friends are in town – tonight we will celebrate in Lunnon family tradition by going out for supper at The Coachman! It’s also the end of a very busy two weeks for me! Sit alone and talk and watch a hawk makin’ lazy circles in the sky. And when we say – Yeeow] A-yip-i-o-ee ay! We’re only sayin’ You’re doin’ fine, Oklahoma! Oklahoma – O.K. JEEPers, this Baviaanskloof is Mooi! Mike Holmes and I were fishing last weekend. Standing on a beach, rods in hand, with the fish not biting leads to lots of chatting and Mike came up with something you might be interested in. Holmes and I have a mutual friend who owns and manages the Baviaans Lodge, which straddles the Baviaans and Kouga mountains and various kloofs. Rob is an avid environmentalist and has built his lodge, which borders on the Baviaanskloof Wilderness Mega Reserve, using eco-friendly methods. Mike was talking about this guy you have on your programme once a week who is suffering from an incurable disease and using his remaining time on earth to discover wonderful places, mainly in hte Eastern Cape. I have heard him on your show once or twice as well. 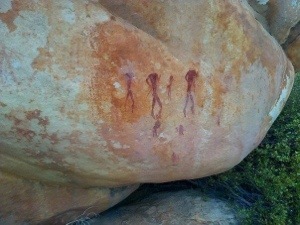 Mike said the guy had mentioned that the Baviaanskloof was one such venue he would like to experience. I have spoken to Rob and he would be delighted to host him — you as well if you can get away. The main feature is the natural beauty. Cycads, fynbos, indignous forests, streams, Bushman caves and really nice rustic accommodation to are the more sedate features while more challenging are river rafting and boating on the Koaga river and the 4X4 route that runs between his lodge and the main road through the Baviaanskloof, the dirt road joining Patensie and Willowmore. There is a time factor involved if you are interested in a visit. The weather is good at the moment, neither too hot nor too cold but the cold is imminent. 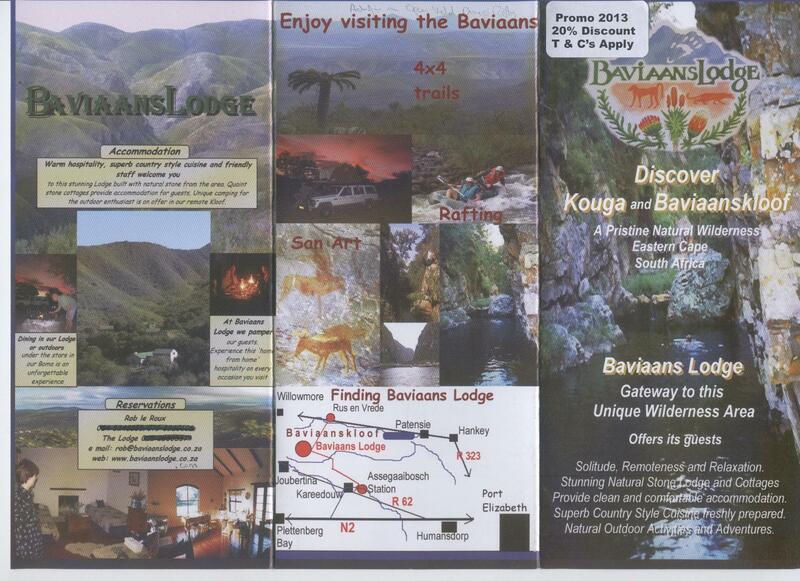 I suggest you have a look at Rob’s two web sites www.baviaanslodge.co.za and www.baviaans-kouga4x4.com. There is no cell phone signal there but you can E-Mail him on rob@baviaanslodge.co.za and possibly organise a Skype conversation. If you do decide to make the trip both Mike Holmes and myself would be keen to possibly tag along to maybe do a magazine article. This e-mail set in motion a sequence of events, further e-mails, SKYPE conversations, plans, “unplans”, replans and final plans that saw Sean and I set off for the Baviaanskloof on Saturday afternoon for an overnight stay at the Baviaans Lodge. Unfortunately, to get all the parties involved to be able to co-ordinate diaries became a mission impossible. Being a “pensioner”, I’m the easy one! Everyone else had “things” to do, but I am dependent on a driver and Sean was only available on Saturday afternoon after work. My memory fails me often nowadays, and we actually left home twice! Firstly, after filling up with petrol, my petrol card had expired and couldn’t be used! I’d pay with the credit card then, only to find that my wallet wasn’t in the car. So then Sean paid and I’d refund him – we went back home to fetch the wallet – only to find it was under the car seat all along! We had no sooner left Port Elizabeth along the N2 and I was telling Sean about a warning light that had gone on in the bus to Cape Town the previous week, when the self-same light came on in our Jeep Wrangler! So we stopped at Jefferys Bay and so did the warning light! Then we went westwards along the Langkloof’s R62 to Kareedouw where we picked up two of Rob’s sons at the school hostel to take them with us to the Baviaans Lodge, our accommodation for the evening and their home. We went back some two kilometres along the R62 to Assegaaibosch Station and then some 40 km north westwards to the Lodge. Despite only being 40km, the road winds up and down and round and round over the Kouga Mountains and River and so it took us about an hour and a half to get there at about 17h00. Along the way, the view is stunning and the wow’s became Wows became WOWS! The final descent into the Valley of the Lodge is an OMG WOW WOW WOW!! No words can do the area justice – hence the pictures attached to this blog should tell the story, and even then, they often don’t tell the full story. We met Rob at the Lodge, then were shown to our cottage and after unpacking and freshening up, returned to the lodge for a chat, drinks and supper. No electricity, no TV (to watch the Kings – TG we only heard the score the next day!) but only paraffin lamps, chatter, red wine and a meal fit for the Kings – onion soup, herbed chicken and malva pudding with hot custard made us ready to hit the sack and settle down under the duvets on a dark, quiet, chilly, crystal-clear evening up in the mountains. That wasn’t the only flickering. The little flames in our bedside lamps (real lamps!) and our eyelids flickered in unison. I think our eyelids closed as we blew out those lamps and before our heads hit the pillows! It put two meanings to the term “lights out”! Sleeping in we did, because we could and, thankfully, had it not been for the crows knocking on the roof that woke us up, we would have been more than just the slightly late that we were for our pre-arranged 9 o’clock breakfast time! Cereal, juice, yoghurt and eggs, bacon, beans, tomatoes and fritters rounded off with hot homemade buns and filter coffee were set before us and almost sent me back to bed for more sleep! But we had a trip to do. 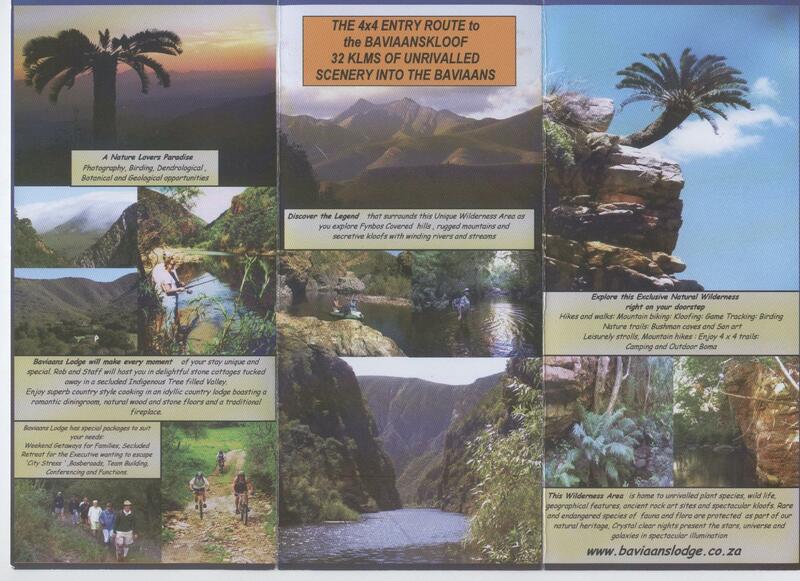 From the Lodge, a 4×4 entry route northwards into the Baviaans Kloof proper (which runs 120km from Willowmore in the west to Patensie in the east) provides 32 kilometres of unrivalled scenery. We must have covered some half that distance: up and down and over and round and down and up and then, unfortunately, because of the time constraints, a u-turn and did it all again in reverse back to the Lodge! The Jeep did us proud. This is a unique, wilderness area right on our doorstep. Each twist and turn in the road would reveal different vegetation, depending on whether it was on the windward or the leeward side of the rugged mountains. Grassy plains next to fynbos, winding rivers and streams, cycads and red and white proteas and other members of this unique plant species, geographical features, spectacular kloofs and bird life had us constantly grabbing for our cell phone cameras to take just another pic! From the highest spot that we went to, we could see St Francis Bay away to the east and the Outeniqua Mountains at George away to the west. In between, luscious green valleys are interspersed by flat-topped plateaus and soaring blue mountain peaks. Rob, our host, cook and guide, told us snippets about the history, the geology, the fauna, the flora, the endangered species, the secrets, the inhabitants, the rock art, the caves and the rock overhangs. There is obviously far too much to talk about and to see and to do, and too little time to do it in! So it was with a heavy heart that Sean and I left at two (with the kids piled in the back to return to school). But we will be back, I hope, to savour some more of this pristine, remote nature lovers’ paradise. Our thanks are extended to Mike Proctor-Sims and Mike Holmes for conceiving the idea and to Rob le Roux and his family for hosting us and for their warm hospitality. It was a truly unforgettable experience. As we left Port Elizabeth in the dark at 6am last Thursday morning, headed for Cape Town, the news reader on the radio was reading about strikes – bus drivers and teachers. Well, neither in this bus was on strike! 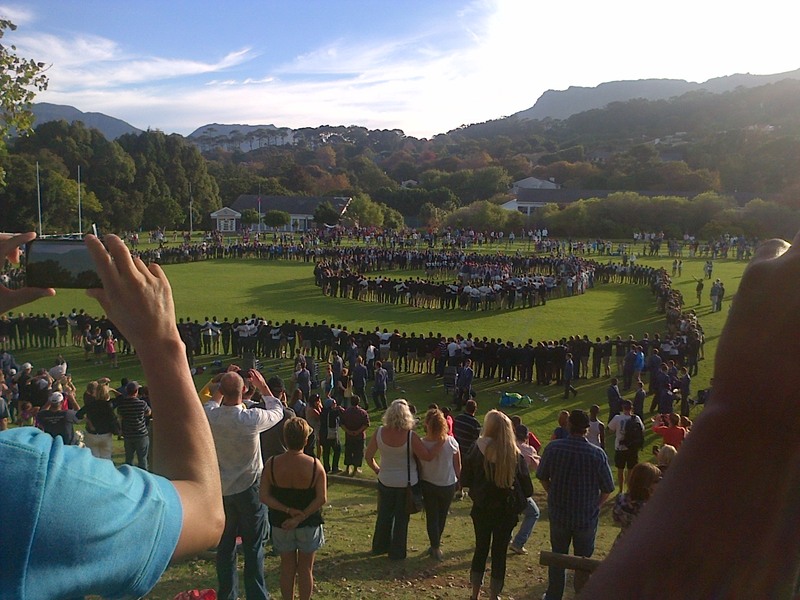 I was travelling in the school bus with Grey’s 1st rugby team to their annual encounter with Wynberg Boys’ High. 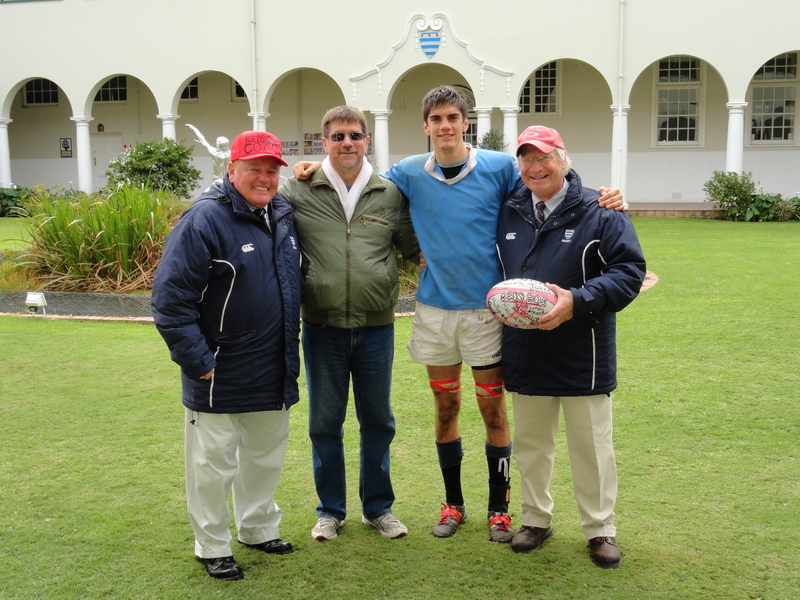 A teacher was at the wheel, the coaches were there, the team was there and I was accompanying them to watch Phillip play his last school rugby game in the Cape. Because of work commitments, Pera and Sean were unable to go, and I was only too thankful to get a lift on the bus. Listening to the news and seeing firsthand the contribution that these teachers make to our children’s education, I was grateful for the dedication of so many teachers that we are privileged to experience. Not many would be up at that time of the morning, accompanying, chauffeuring, coaching and driving. The irony being that it was exactly those teachers who would not do these things that were now on strike! Wanting more for doing less! In front of us and behind us over the next four days, many other buses (with non-striking drivers?) transporting hundreds of boys and teachers, and many cars with parents and children, would all be heading for Cape Town – and back. It wasn’t a pleasant trip. Warning lights, strange noises, flat wheel and no air-conditioning on a 30 degree day added to the stress. But I was home in Strand at 16h00. My nephew-in-law Sebastian picked me up at the N2 national road and by 18h00 I was having a walk along Milk Bay Beach. I had grown up on this beach and the weather was picture perfect! Later, my sister Lyn and brother-in-law Anton came to visit for a quick catch-up! On Friday morning we headed for Stellenbosch and a visit to Helshoogte to discuss the upcoming 40th reunion to which I will return in two weeks’ time. It was great catching up with current prim Jason Katz and seeing all the new developments in the House and on the University campus. More residences and buildings are rising on areas that used to be our parking places! Stopping in for coffee at La Romantica was also an exercise in struggling to find parking (Stellenbosch has become a driver’s nightmare). Not only the parking was full, but also the pub at eleven in the morning – everyone was watching Super 15 rugby! So this was how economic South Africa spends its Friday mornings … all whilst the bus drivers strike and cause mayhem country wide for higher wages! The usual Friday Ridgway braai followed, together with a large group of participants catching up on the business of The Strand, and then, after a short nap, we headed for Wynberg. The Grey Old Boys were playing golf against Wynberg Old Boys and we joined them at the nineteenth hole – the Billy Bowden pub at Wynberg High. Even old Rector Dieter Pakendorf and his wife Maureen were there – and it’s always a pleasure visiting with my sharp ex-boss – despite the toll taken by age and health! And Hansie Harker was there! In his forty years at the school, I don’t think he’s been on strike for 1 day! And he’s approaching retirement days and, like so many of us, also experiencing health issues. All that changed this past weekend when the school flew him to Cape Town, and took him on the touristy things and even a trip up Table Mountain! Phillip’s 3rd team (“Tommo’s Reds” in which Sean also played in his day!) did us proud. They came back from a large deficit at the half to eventually win the game: another lesson in “never give up”! It was an exciting game to watch and made up for the losses of the second and first team. Too soon it was all over – and we left Cape Town at 19h00 on Saturday evening on a through-the night trip back to Port Elizabeth (my first!) arriving at home at three thirty in the morning. Thank God that He made Sundays a rest-day! My thanks, too, must go to the non-striking teacher and bus driver Daryl Wicht for getting me safely there and back, Rory and Tim for their company, Sebastian and Nico de Vries for their hospitality and to all the others who made this last school trip to the Western Cape possible for me. Sun 21: Relax and Sleep and London Marathon! Sean left school at the end of 2010. I had set it as one of my goals to see him get into matric and to leave school. That was because I had been told in February 2007 that I would be “severely incapacitated” by 2010 (three years!) and dead by 2012 (five years!). Well, now it’s 2013 and Phillip is in matric and I’m not dead and neither am I severely incapacitated! I am grateful for this extra time. I haven’t even set myself a goal of seeing Phil getting to the end of his school career! I have just assumed that I will still be here. I just don’t know anymore! But, what I do know is that everything we do with Phil at school this year is “for the last time”. The chicks are slowly leaving the nest, and by next year, we will no longer have children at school. That chapter will be closed. 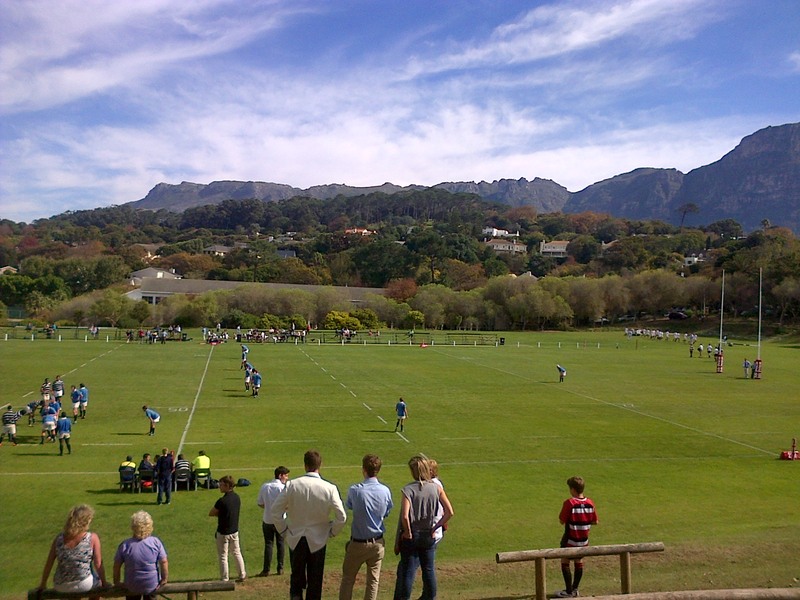 This Saturday is our last encounter against Wynberg in Cape Town, and I hope to go down to the Western Cape for that. Then there’s Bloemfontein later this year and NO I’m not organising any trains for parents to Bloemfontein! I did one in 2007 and one in 2009 and they were the best, coldest, latest, drunken trips to Bloem that I have ever done. Luckily, I don’t think the SA Railways even has spare coaches any more, and I’m not even going to try to find out if they know where their rolling stock is! But as one door closes, the next one opens. So today I had to fill in some forms for Phillip’s application to Stellenbosch University next year. He wants to do mechanical engineering at my Alma Mater. It was a scene of déja vu. I could see myself filling in my own university application forms 40 years ago! The difference is that we physically filled in paper forms and made bank deposits – now it’s all “online” and EFT transfers! We’ll keep our fingers crossed that his application will be successful. And he wants to stay in Helshoogte Residence – she was my very happy home for 6 years. And I was her primarius in 1981. And while I’m filling in Phil’s application forms on the one side, I am also busy filling in my forms to attend Helshoogte’s fortieth birthday party next month. 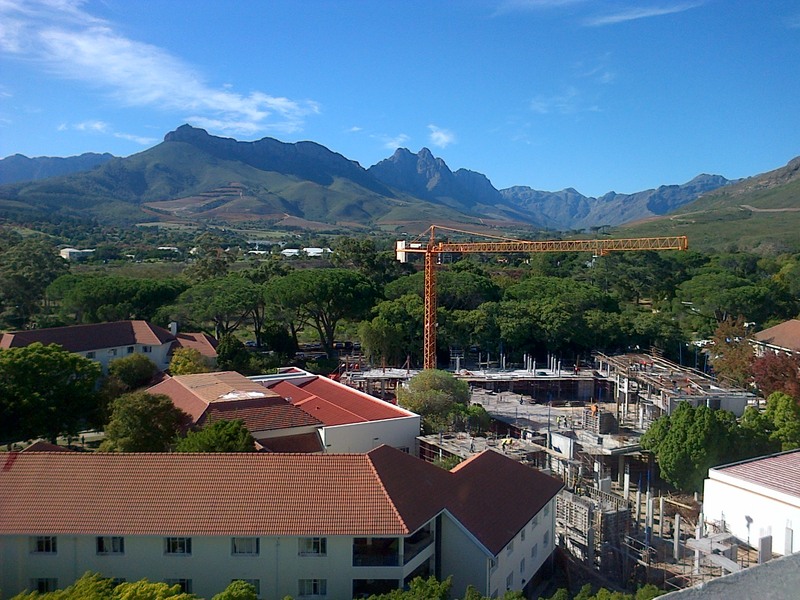 Even though it clashes with the reunion in May of my last matric class that I taught at Grey, I certainly won’t miss “Heaven is a place on Earth” – Stellenbosch, my birthplace and place of my education. Born and bred in Matieland! So I’m trying to juggle times and planes and lifts and accommodation to maximise my attendance at both reunion functions on that second weekend in May. Of all the 52 weeks of the year, why, oh, why are these two reunions on the same weekend? Life can not just be simple, can it? Not even with good old customer service. Not for the last time, I hope, I headed off to Tavcor Motors this afternoon. Last year, I had some bad service from them with Sean’s car and often businesses mess up even more when they go into recovery mode. Not them! They have made it up to me in leaps and bounds. I can only thank and congratulate Garrick and his two PA’s, Elaine and Yolande, for the most unbelievable excellent service – way beyond the call of duty – that they have given to me with the repairing of Sean’s Polo that was damaged in the hailstorm outside Graaff-Reinet two months ago. If this is the type of service that they offer then I can only recommend them in future. On Good Friday, at 6am, we headed off westwards along the N2 – destination the Swartruggens and the Cederberg in the Western Cape. The original plan was to go from Ladismith through the Seweweekspoort Pass to the N1 at Laingsburg. But the weather changed the plans (which included a breakfast at Hartenbos with the Engelbrechts, friends from Stellenbosch student days) and eventually we did Swellendam, Bonnievale, Montagu, Koo Valley, N1, Touws River and finally the gravel road to Kagga Kamma (Place of water) Game Reserve – arriving there at 18h00! Friday night, in our cottage for the next week, became an early night with no hot water! Saturday morning was an early morning to watch the Kings on TV at the bar – the only TV at the resort. Furthermore, there was no TV, no cell phone reception, no wireless, no Facebook, and even the electricity went off for a while later in the week! We were here to relax and that we did! A 4km hike through the bush and over the boulders left me with a swollen, sore, sprained ankle on my good foot! So no more walks for me! You just can’t win! Pera managed another 8km walk later in the week and not even the heavy rain deterred her. Sean and I got worried and drove out to find her – which we only managed on the second rescue mission attempt. Phillip is training for the rugby season – so what we walked, he ran, and he ran, and he ran again and all of this at the altitude of Table Mountain! Sean was the chauffeur and clung to the wheel – from here to there and back and every other trip we made. That included our Easter Monday trip to Ceres and Tulbagh where we met up with my family Sebastian, Michelle and Hannah. Lunch, for me a lovely snoek pie, was eaten at the old Toll house in the Mitchell’s Pass and dessert (chocolate pancakes) at the historic Church Street in Tulbagh. Buildings from our more recent colonial European history just 400 years ago! Not even the 6,9 Richter scale earthquake on the 29th September 1969 at 22h29 which I remember well from my Std 5 schooldays and which had its epicentre in this area could destroy this history of our country. It woke us up and had us running into the street in The Strand, my hometown – here it killed some 9 people. Our other road trip was north through the Cederberg via Algeria (where I had camped as a high school scholar) to Clanwilliam where I tried the babotie and we tea’d at the Rooibos factory at the centre of our unigue Rooibos industry. Home from there took us through Citrusdal and its citrus farms, over a steep, curved gravel pass back to Oppi-Berg and the Kagga Kamma. All trips in and out of Kagga Kamma took us over 15km of rough, corrugated, pot-holed, stony gravel road and over the Katbakkies Pass or Skittery Pass – no barriers and sometimes an incline over close to 45 degrees! Other passes we traversed during the week were Kogmanskloof,Burgers, Rooihoogte, Die Venster, Gydo, Mitchells, Middleberg, Meiringspoort, Ghwarriepoort, Buyspoort, Perdepoort, Swanepoelspoort, and national roads we used were the N2, N1, N7, N12, N9 and numerous other minor tarred and gravel roads. At the resort, we braaied, ate at the restaurant (a beef strip salad with balsamic vinegar was my favourite), russled up, with Pera’s help, a number of great recipes (and an exploded boiled egg in the microwave!) There was no shop in this wilderness to buy supplies, so Sean invented a recipe for French toast when the egg supply ran low! It was great family time and so besides the kitchen and cooking duties, we played board games, chess, read, chatted, drank, laughed, discussed, questioned and gazed at and almost touched the stars in a clear black night sky. Both Sean and Phillip learned to drive here on the farm – tractors, “skadonk” and whatever other bakkies were available. 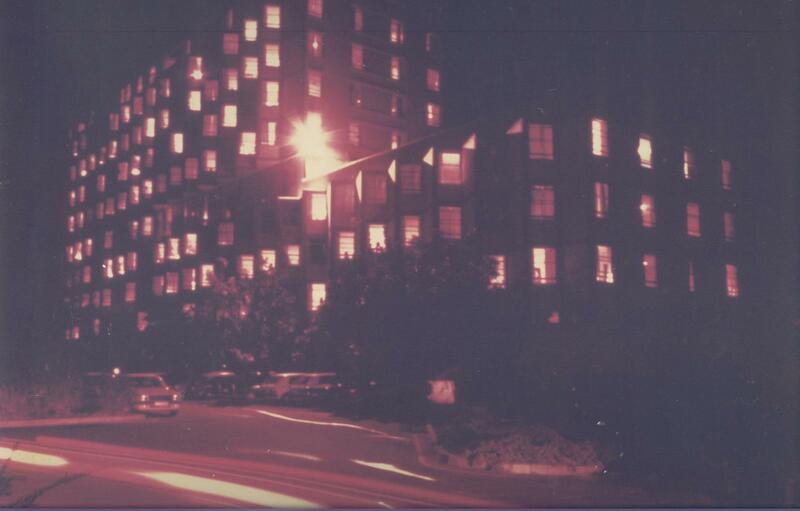 We all have good recollections and happy memories of this place. A weekend of friendship fit for Kings – we had followed our rugby team on Twitter and they had drawn with the Brumbies on Friday morning, too, so life was sweet! All good things come to an end, and so Sunday lunch time indicated that it was time to head back to Port Elizabeth and to home, where we arrived at 17H00. It was a great trip providing us with good family bonding time and an appreciation of the beauty of our country and of life. The car was heavier – with many memories, and stones collected in the Tanqua Karoo (the driest area of South Africa) and plants from the Great Karoo and the Camdeboo. We are truly privileged. Life is good!